Music Appreciation that comes straight to your inbox! 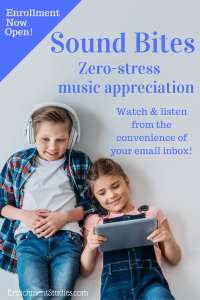 Easily introduce your kids to the magnificent music of the classical music eras with Sound Bites, our daily music appreciation program that comes straight to your inbox! You’ll receive a simple email each weekday that features the music of the day. One click from that email will hop you right over to youtube so you can watch & listen to a video of the featured piece. Easily accessed on your phones, tablets, and computers, you will finally be able to include a consistent music appreciation component to your days, without any planning required. Carefully curated videos offer a close-up view of instruments, singers, art, nature, and places where the arts happen all over the world! Students will naturally see that music is for everyone, thanks to the inclusion of videos depicting musical performances by men and women from all over the world, with different skin tones and nationalities. Sound Bites will be delivered straight to your inbox, making it easy for you to watch and listen on your phone, tablet, or computer! Better than a collection of CDs, Sound Bites takes full advantage of the interconnectedness that music offers by bringing video into the mix. In this collection your children will get to see instruments being played by skilled musicians, get to observe different sized groupings of players, and various types of singers. The variety of settings in these videos are stunning, and include some of the most gorgeous opera houses and concert halls around the world. Many of the videos include beautiful art, or scenes from nature. In some cases the videos show authentic instruments from the musical era in a way that we rarely get to see today. Some of the music is presented as part of an opera, or in period costume, or includes other historical details or creative items. The video element allows this program to create a much fuller form of music appreciation than simply listening. Instead, you get to see, experience, and become aware of musical performance and presentation in a wide variety of beautiful and inspiring ways! Sound Bites: Baroque & Classical is coming back for a second semester option starting January 7, 2019. Click here to sign up for notifications for when Sound Bites is available again. Sure! Click here to see one of the Sound Bites emails. As you’ll see, they are a very simple format. In some emails I add some information about the composer or piece, or just share something I thought about it. In other emails I simply introduce the piece and that’s all. In cases where there is sung music, I’ve tried to provide English translations/lyrics. For religious pieces (such as The Messiah) I have included the Bible verses/lyrics for that piece. How long does Sound Bites take each day? We have pieces are short as a couple minutes, on up to some longer than a half hour. That being said, you do what works for you. Obviously the shorter ones are pretty easy to find time for, but for the longer ones, you can choose to play it in the background while doing other things, or only listen to part of the piece. * Keep it enjoyable for the children. Find a way that works for your ages and stages. Let music be a gift and a joy in your home! * Some is better than None. * It doesn’t have to be perfect to be powerful. I don’t know if I have time to use this. Sound Bites is ready when you are. The emails should be delivered Monday-Friday around 7am eastern time, but you can watch & listen when it works for you. Weekends, car rides, while eating or doing chores–whatever works for you will work for Sound Bites. How is this arranged? Is the music presented in chronological order, or by composer? Sound Bites: Baroque & Classical has a strong focus on making sure there is exposure to all of the “greatest hits.” However, I decided not to do them in composer units, because if you don’t like a particular composer’s style and you’re stuck with them for a month or more, it can be unpleasant and nobody wants to go through that. lol Also, I wanted to feature music that works with seasons and holidays, so it has an additional connection to our current lives. Sound Bites: Romantic Era is still in development, but several of our families requested composers be presented in units, so we are aiming for trying that approach with this collection that will begin in September 2018. I didn’t do chronological because it’s just too complicated for me to do that with 180 piece selections, and again, that would tend to lump similar styles together all in a row, which I felt might not be as enjoyable for the children. What time period does Sound Bites cover? Sound Bites: Romantic & Modern Era covers approximately 1800-early 1900s. What if I want to re-use the emails next year? The links in the emails are to YouTube videos, so they are available when you are, and won’t expire, per se. I’ll actually be receiving my Sound Bites a couple days before everybody else so I can make sure the links are still live, so everything should be working when you get it. For the most part, I selected videos with lots of views that have been around for awhile, which made me think they had an excellent chance of staying right where they are. That being said, I don’t have control over whether or not the owner of the video takes it down, so there is a chance that if you don’t get around to watching the video for a long time, it might not be there any more. I don’t plan to update the links this year beyond making sure they are live when you get them, so if you miss a day and circle back to an older email and the video is no longer available, you can just do a search to find another video of that piece. Certainly you can save and re-use your emails and enjoy the same music over and over again. What if a video is no longer available when we receive it? I’ll be doing my best to avoid that, but if it happens, I’ll be hurrying to send you a replacement as soon as possible. Do I have to have youtube? Is this music downloadable? Do I have to have wifi or a data plan? What you need to make this work: Email and access to youtube. The videos are meant to be enjoyed on youtube. I don’t know nothin’ ’bout birthin’ no babies….wait….yes I do….ahem. What I MEANT is, I have no idea if you can download youtube videos or not, but that isn’t the design of this program. Wifi/data: You’ll need to use whatever mechanism you normally use for accessing email and youtube. I have kids with their own email addresses. Do I have to pay to sign each child up for Sound Bites? No way! One enrollment in Sound Bites covers your whole immediate family. 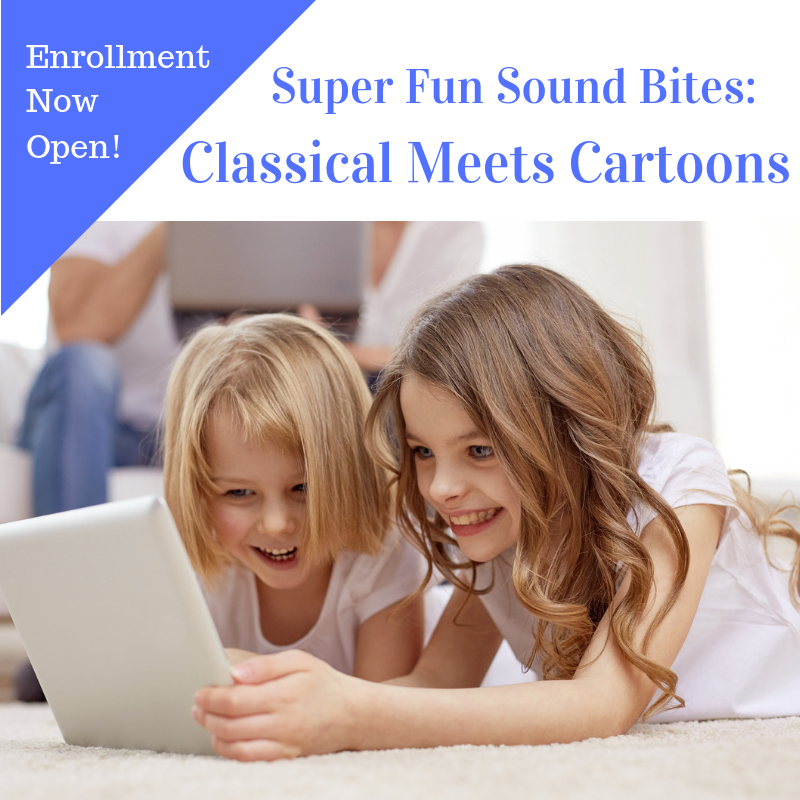 If you have kids with email addresses that you want to receive Sound Bites directly, check the instructions in your Welcome email after you enroll. Do Whole Shebang members get Sound Bites for free? We had so much fun with day one of sound bites! I have to tell you that Vivaldi Four Seasons has always been one of my favorites compositions and when you sent that as day one I was thrilled. Then, I watched the amazing youtube clip with the kids while we were eating breakfast…and I have to tell you that while I have listened to this piece of music at least a hundred times…I never took the time to watch it being played live at the same time. It was So. Much. Fun to watch and so incredibly beautifully done it literally brought tears to my eyes. My daughter asked if we could watch Autumn next! And of course we did. Today I had to play [Sound Bites] in the background while we were doing math and it was also so lovely and relaxing that math went much better than usual. I know I mentioned how much we are enjoying Sound Bites, but I forgot to mention that we not only enjoy the music, but the imagery for most of the selections has been MAGNIFICENT. Not only has Sound Bites been an auditory joy, but visually as well. What more could a home school classroom ask for??? So once again, thank you for making art, music and history SO easy to enjoy and incorporate into our daily routine. We are so appreciative of the daily Sound Bites! We miss them some days but its been a fantastic way for me to introduce regular doses of such intoxicating music to our days. And it calms (or enthralls) my 4 kids during those crazy (or dull) moments in life :). You are truly enriching our lives with all of your resources…. “Sound Bites is our breakfast activity each morning and my 2 and 3 year olds are LOVING it! Some days they want to see the videos, some days they ask to see it played on the TV (I usually just set my phone on an easel to play), and some days they ask for it to play through our diffuser’s speaker. They’ve asked me to pause it until they’ve finished eating so they can dance, they’ve wiggled in their seats, they’ve compared it to other versions they’ve heard (especially if it was featured on Little Einsteins). I signed up, originally, not expecting a lot of interaction from them. Mostly just wanted to get an idea of the program before implementing more structure in our homeschooling in the coming years. However, regularly they tell me what instruments they see, discuss how pieces make them feel, discuss different features of the piece (even using technical terms-crescendo, allegro, etc). They even tell their father about pieces that really speak to them at night during supper, so much so that he has me forward him the videos at work so he can watch before he gets home so he can join the discussions! To sum this novella up, thank you for this program! It has added such richness and depth to our homeschool and has taught me to never underestimate my children! Introduce your kids to the fun of classical music by showing them cartoon clips that feature classical tunes! The fun, 5-week music appreciation program comes straight to your inbox, making it easy and fun for the whole family! Watch the videos from your phone, tablet, computer, or other device anytime it’s convenient for you! This program will be open again sometime in 2019.Click here to be added to the notification list . Want to see a sample? You can see one of the emails from Classical Meets Cartoons here. My son is three and is autistic- he loves anything with music, the cartoon/classical mashups have been really entertaining for him! Thank you for putting this together and sharing it with us! “Sound bites is perfect! I turned it on while everyone was doing math. We immediately agreed that “Summer” did not sound like summer to us, which led to a need to listen to every other season and see if we found them, in our opinion, to be a better representation of the actual season. We listened to 40 minutes of music, all while doing math, with interesting discussion/evaluation happening while we listened. We are in love! “This is awesome! You are amazing! You literally are taking all of the work out of this for us. I can’t wait to use Sounds Bites.